Valley Advocate: Don’t Just Sit There—Read! We're in the news! Masslive had a great article about us. Check it out! 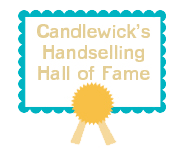 Our own Hannah Moushabeck was named one of Candlewick's Handselling Indie Recognition Program Hall of Famers! Congrats, Hannah! 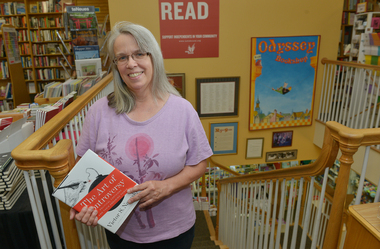 Also, Joan was featured in an article in the Republican about the survival of independent bookstores. Check it out here! We had a lovely retirement party for longtime Odyssey co-owner Neil Novik with many past and present members of the Odyssey team! He had held the position since coming to the bookstore in 1998. 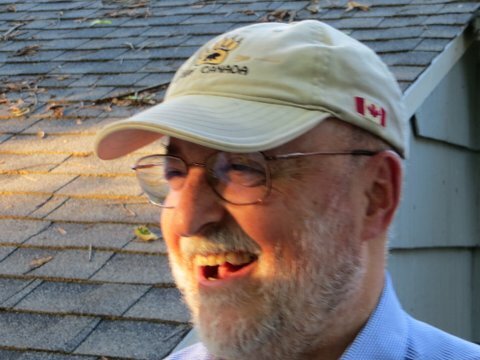 While Neil is using the word retire, "I will still be in the store about one day a week (usually Mondays) through the summer to help the new textbook manager prepare for the fall semester. I will also continue to host the Odyssey Crime Club reading group (second Monday of every month) at least until the end of 2012. So I hope to see many of you at some point. Again, thank you for your kindness and support." 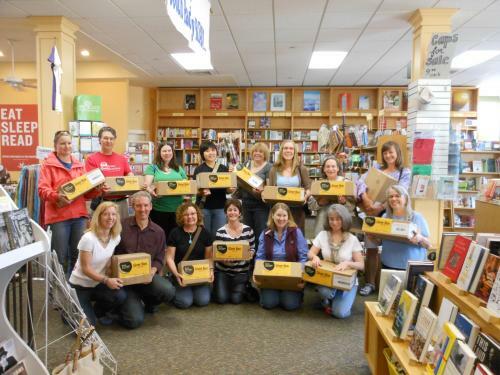 These people holding boxes are all getting ready to give away an entire box of books for World Book Night! The Odyssey is very proud to be involved in World Book Night, an annual celebration to spread a love of reading and books. These books will be given out in places chosen to try to find new adult readers, just a few of the places our givers will be distributing are Holyoke Hospital, Jessie's House, Girls Inc., the Care Center, and many public high schools around the Pioneer Valley. 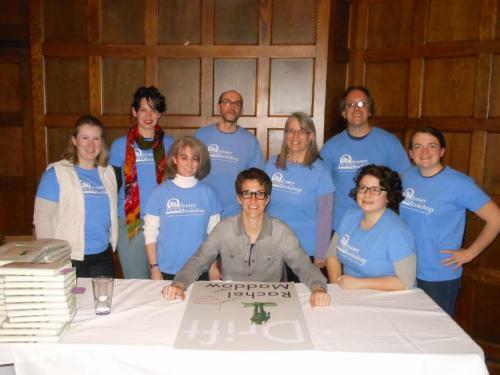 The Odyssey is very proud to have hosted Rachel Maddow at the beginning of her book tour for Drift: The Unmooring of American Military Power! 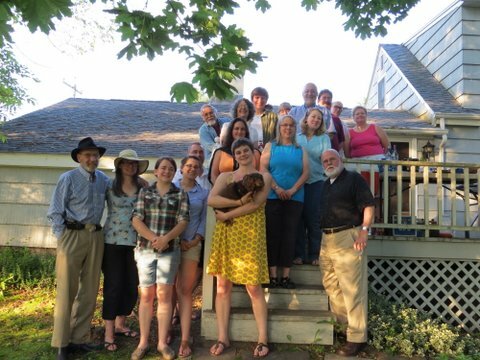 The Mt Holyoke Office of Communications conducted this interview before the lecture and was kind enough to share it with us. You can also find pictures from the event here. Thanks to all who made this event such a great success! program, which handpicks gift books for kids from the store's fantastic children's section. The citation said in part: “Having made your way, with sure purpose, down the Connecticut River from Quebec to the city of Holyoke and an apprenticeship in the pharmacy of Simon Flynn; and having attached yourself, with surer purpose, to Miss Elizabeth Flynn; you then, with surest purpose, pointed your destiny at the town of South Hadley, the drug store of Glessmann, and the college of Mount Holyoke. You had resolved to be the most cultivated apothecary since John Keats (1795-1821). Daily, after long breakfasts complicated by culture, you motored to work, fashionably late, in superannuated Cadillac convertibles, meditating changes involving profound value judgments. Soon aspirin and toothbrushes had to be sought with difficulty amid shelves and more shelves of books and records and prints. Putting first things first, you abandoned your pharmacopeia and moved to your grand new emporium of arts and letters. 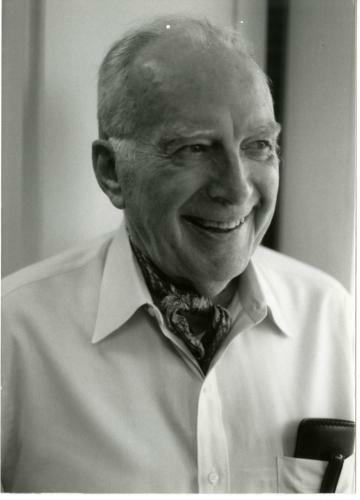 You gave an intellectual home to the colleges of the Valley. You gave us credit, you gave us discounts, you cashed our perilous checks. You remembered our names, young and old. 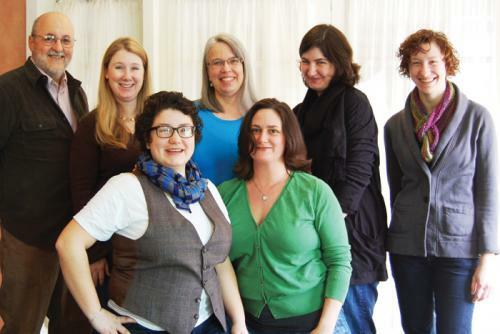 You loyally displayed, and occasionally sold, the fugitive productions of Mount Holyoke professors. Air stagnant with Muzak and tunned with Rock you purified with Mozart. You made us confident that at least two eats would be filled at every significant college event. You saw to it that every book orth having could be had at the Odyssey.